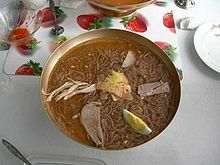 P'yŏngyang-raengmyŏn (평양랭면) is a cold noodle dish. Some North Korean dishes and foods are also prepared in South Korea, and a multitude of dishes that originated in North Korea were brought to South Korea by migrating families after the Korean War. Many of these imported dishes became staples in the South Korean diet. In North Korea, some dishes vary in flavor compared to South Korean versions, with some North Korean dishes being less spicy and more varied in composition compared to South Korean preparations. North Korean dishes have been described as having a unique and specific tanginess that is derived from using ingredients with flavors of sweet, sour, pungent and spicy, in combinations that create this effect. Some restaurants, particularly in Pyongyang, the capital city of North Korea, have expensive pricing relative to average worker wages in North Korea. Accessibility to restaurants is not always available to average North Korean citizens, with tourists and rich citizens being the primary patrons at some of them, particularly upscale ones. Per their pricing, upscale restaurants are typically only available to well-paid leaders of the North Korean government, tourists visiting the country, and the emerging affluent middle class of donju in the country. Donju means ""masters of money", and the donju typically hold positions in the government, positions operating state-owned businesses outside of the country, and positions involving bringing investments and the importation of products into the country. Some street foods exist in North Korea, such as in Pyongyang, where vendors operate food stalls. North Korea's first pizzeria opened in 2009. Alcoholic beverages are produced and consumed in North Korea, and the country's legal drinking age is 18. Bindae-tteok – a fried green bean pancake prepared using mung beans, green onion and kimchi. Bindae-tteok first appears under the name binjatteok in the Eumsik dimibang, a cooking encyclopedia written in the 1670s by Jang Gye-hyang, the wife of a public officer. Chokpal – consists of pig's trotters cooked with soy sauce and various spices. Additional ingredients can include onion, leeks, garlic, cinnamon and black pepper. Gajami sikhae – a fermented and salted food prepared in North Korea using flounder and additional ingredients such as quinoa, garlic, ginger and chili flakes. Injo gogi – sausages prepared using soybeans and other ingredients. Injo gogi bap - cooked rice wrapped in a skin of leftover soybean paste. Kimchi – very common in North Korea, it is consumed as both a condiment and as a side dish, and often accompanies every meal. Kimchi is relied upon by North Koreans during the winter months when fresh vegetables are unavailable. Meats – meat consumption tends to be rare in North Korea, and most citizens only have access to meats during the public holidays of the birthdays of Kim Il-sung and Kim Jong-il, when extra meat is included in government rations provided to North Koreans. Meats that are consumed include mostly pork, rabbit and occasionally goat. Beef consumption is essentially not allowed in North Korea, but very limited consumption of small amounts of beef is permitted, which is sometimes used in stews or soups. Noodles and noodle dishes – in North Korean culture, long noodles represent a long life or a long marriage, and long noodles are served to people at weddings. 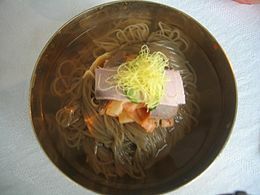 Raengmyŏn – referred to as "naengmyeon" in South Korea, it is a traditional Korean cold noodle dish that is prepared using buckwheat noodles in North Korea. In North Korea, additional ingredients in the dish typically include some slices of meat, dried egg and hot sauce. The noodles are prepared using the flour and starch from ingredients such as buckwheat, potatoes and sweet potatoes. Some variations of the dish in North Korea is to include raw fish, cucumber, radish and Asian pear. Some North Koreans state that raengmyŏn originated in North Korea, and that it was introduced to South Korea by North Koreans who emigrated to South Korea after the Korean War occurred. Potatoes and potato dishes. See also: potato production in North Korea. Rice – short-grain rice is a staple food in North Korea, but rice shortages occur in the country, particularly for white rice. Snack foods – examples of snack foods produced within North Korea include gangjeong, cookies, puffy snacks and cotton candy pieces. Tofu bap – a tofu and rice dish that is a common street food in North Korea. Dried pollock at the Rakwon Paradise Microbrewery. Dried pollock is a typical bar snack in some areas of North Korea. A North Korean propaganda poster stating, "Breed more rabbits and let our soldiers enjoy plentiful food!" Some condiments used in North Korea to add flavor to foods are listed below. Bottled water is imported from China, and is typically consumed by the donju, "the new affluent middle class" in North Korea. "Sindeok Saemmul" is a spring water produced in North Korea, but it is exported to countries in Southeast Asia, and is typically not available in the North Korean market. Soft drinks – soft drink bottlers exist in North Korea, such as the Wonbong Trading Co. in Pyongyang. Soft drink products produced within North Korea are sometimes labeled as "carbonated sweet water". Imitations of major soda brands, such as Coca-Cola, are produced in North Korea. Sometime in 2017, Air Koryo, North Korea's flagship airline, began offering its own brand of soft drinks on flights to and from Beijing, China. Air Koryo soft drinks are also purveyed at some North Korean grocery stores. Coca-Cola bottled in China is available in upscale grocery stores in Pyongyang, and Pepsi bottled in China is also available, although it is rare compared to Coca-Cola's availability. Alcoholic beverages are consumed in North Korea, and drinking is a part of the culture of North Korea. North Korea's legal drinking age is 18, but minors are sometimes allowed to consume alcoholic beverages, and some shop keepers readily sell them alcoholic drinks. Some North Koreans brew and distill alcoholic beverages at home, despite such home alcohol production being forbidden in North Korea, and some sell these beverages to markets, although this is also illegal. 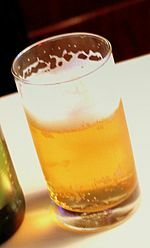 Home brewed liquor is made using ingredients such as potatoes and corn. Some North Korean consumers purchase alcoholic beverages directly from alcohol-producing factories in the country, using cash. In recent times, imported Chinese liquor has been allowed to be sold in markets, and a well-known Chinese liquor purveyed in North Korea is Kaoliang Liquor, which has a 46-50% alcohol content. North Korea has some bars and other drinking establishments, and in recent times, beer halls have become popular in Pyongyang. Beer is produced in North Korea, and craft beer production has increased in recent times. The major breweries in the country are Taedonggang Brewing Company, Paradise Microbrewery and the Yanggakdo Hotel Microbrewery. In August 2016, the Taedonggang Brewing Company held the country's first beer festival, which included several Taedonggang varieties and other local beers. Local beers at the festival included rice beer and dark beers. Taedonggang – brewed by the state-owned Taedonggang Brewing Company based in Pyongyang In 2017, Taedonggang was the most popular beer in North Korea. 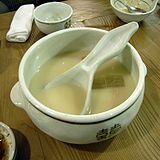 Makgeolli – a specialty rice wine with a milky appearance, it is common in the countryside of North Korea Makgeolli is produced using the same process used for the production of soju, and typically has a lower alcohol content compared to soju. It is considered by some to be inferior compared to soju. Rice liquor – rice-based liquor is consumed by more North Koreans compared to beer. Soju – referred to as nongtaegi in North Korea, soju is a clear specialty spirit prepared from sweet potato or barley in North Korea. It is similar to sake. In North Korea, soju's alcohol content ranges from 18 to 25 percent. ^ "In North Korea it is only the high-ranking government officials and military officers who can afford to give and receive boxes of Shin Ramyun as a present," – stated to Radio Free Asia by a Seoul-based North Korean defector. ^ "Food". Korean Culture and Information Service. Retrieved 15 July 2014. ^ a b c d e f g h Gentile, Dan (February 28, 2014). "Korean food: The 12 essential dishes you need to know from the North and the South". Thrillist. Retrieved May 19, 2017. ^ Lankov, Andrei (June 11, 2014). "Why Pyongyang's restaurant scene is thriving". The Guardian. Retrieved May 17, 2017. ^ a b c d e f g h i j k l m n o Dixon, Laura (September 15, 2010). "Common Food in North Korea". USA Today. Retrieved May 17, 2017. ^ a b c d e f g h i j k l m n o p q Demick, Barbara (October 8, 2011). "The unpalatable appetites of Kim Jong-il". The Telegraph. Retrieved May 19, 2017. ^ a b Killalea, Debra (May 17, 2016). "Pyonghattan: Life inside North Korea's brat pack". News.com.au. Retrieved May 17, 2017. ^ a b Fullerton, Jamie (March 29, 2017). "Munchies in North Korea: A Visit to Pyongyang's Newest Pizza Joint". Vice. Retrieved May 17, 2017. ^ a b c Song Ah, Seol (September 30, 2014). "Bottled Water Gaining Popularity in Markets". Daily NK. Retrieved May 19, 2017. ^ Song Min, Choi (December 9, 2015). "North Korea's nouveau riche spend like there's no tomorrow". Daily NK. Retrieved May 20, 2017. ^ Pearson, James; Park, Ju-min (June 4, 2015). "Pyongyang Bling - The rise of North Korea's consumer comrades". Reuters UK. Retrieved May 20, 2017. ^ Fifield, Anna (May 14, 2016). "North Korea's one-percenters savor life in 'Pyonghattan'". Washington Post. Retrieved May 20, 2017. ^ "Bread and circuses". The Economist. August 6, 2015. Retrieved May 20, 2017. ^ Sang-Hun, Choe (April 30, 2017). "As Economy Grows, North Korea's Grip on Society Is Tested". The New York Times. Retrieved May 20, 2017. ^ Jeffries, I. (2013). North Korea: A Guide to Economic and Political Developments. Guides to Economic and Political Developments in Asia. Taylor & Francis. p. 408. ISBN 978-1-134-29033-8. Retrieved May 18, 2017. ^ a b c d e Yoo-sung, Kim (June 9, 2015). "Ask a North Korean: what's the street food speciality?". The Guardian. Retrieved May 18, 2017. ^ a b c d Kaiman, Jonathan (May 4, 2017). "You've got the munchies and you're in North Korea. Don't worry - we're here to help". Los Angeles Times. Retrieved May 19, 2017. ^ "Five interesting facts about North Korean leader Kim Jong-un". The Jakarta Post. February 18, 2017. Retrieved May 20, 2017. ^ a b c d e f g h Lee, Je Son (December 14, 2015). "Ask a North Korean: do you drink alcohol?". The Guardian. Retrieved May 20, 2017. ^ a b c d e f g h i j Hu, Elise (September 5, 2016). "Would You Like A Side Of Propaganda? Lunch At A North Korean Restaurant". NPR. Retrieved May 17, 2017. ^ a b c d e Ungerleider, Neal (January 3, 2011). "Karaoke! Espionage! Haute Cuisine! : Adventures in the North Korean Government's Restaurant Chain". Fast Company. Retrieved May 17, 2017. ^ a b c d e f g h 장, 밥을 주식으로 하고 국과. "조선료리". 조선료리 (in Korean). Retrieved May 17, 2017. ^ a b c d e f g h i j k l m n o p North Korea Food and Drink. World Travel Guide. ^ a b c d e Kaiman, Jonathan (April 28, 2017). "We went to North Korea. You asked hundreds of questions. Here's what we found". Los Angeles Times. Retrieved May 19, 2017. ^ Faratin, Pejman (February 25, 2014). "Dog meat or "Dan go gi" in North Korean expression, is placed on a table at a famous restaurant in Pyongyang". Metro. Retrieved May 17, 2017. ^ Winter, Stuart (August 16, 2016). "Now Kim Jong-un wants North Koreans to eat DOG for 'stamina food'". Daily Express. Retrieved May 17, 2017. ^ a b c d e f g h i j Fullerton, Jamie (March 29, 2017). "A Guide to North Korean Food from a Man Who's Been Eating It for 14 Years". Vice. Retrieved May 19, 2017. ^ Gander, Kashmira (January 11, 2017). "North Korean Cuisine: A Guide to the Food and Drink of the Hermit Kingdom". The Independent. Retrieved May 19, 2017. ^ Yonhap News Agency, S. (2002). North Korea Handbook. M. E. Sharpe Incorporated. p. 364. ISBN 978-0-7656-3523-5. Retrieved May 17, 2017. ^ a b c d e f Hassig, R.; Oh, K. (2015). The Hidden People of North Korea: Everyday Life in the Hermit Kingdom. Rowman & Littlefield Publishers. p. 24. ISBN 978-1-4422-3719-3. Retrieved May 17, 2017. ^ a b c Williams, Martyn (July 22, 2014). "North Korea launches cooking website 'for housewives'". The Guardian. Retrieved May 17, 2017. ^ a b Le, Kyle (March 21, 2016). "My Surreal Experience Eating In A North Korean Restaurant". The Huffington Post. Retrieved May 17, 2017. ^ a b c "Shin Ramyun, Ramen of Choice in North Korea". Daily NK. June 3, 2009. Retrieved May 17, 2017. ^ Jenkins, C.R. ; Frederick, J. (2009). The Reluctant Communist: My Desertion, Court-Martial, and Forty-Year Imprisonment in North Korea. University of California Press. p. 129. ISBN 978-0-520-25999-7. Retrieved May 17, 2017. ^ Kim, Violet (November 22, 2011). "40 Korean foods we can't live without". CNN Travel. Retrieved May 17, 2017. ^ a b Shalhoub, Lulwa (April 27, 2017). "From kimchi to rice cakes: Korean cuisine has something for every foodie". Arab News. Retrieved May 19, 2017. ^ "Noodles Hot in North Korea". September 22, 2009. Radio Free Asia. ^ Krishnamoorthy, Nandini (February 10, 2017). "North Korea marks Kim Jong-il's birthday in style with pheasant meatball soup and cocktails". International Business Times UK. Retrieved May 19, 2017. ^ Jacobsen, C.; Nielsen, N.S. ; Horn, A.F. ; Sørensen, A.D.M. (2013). Food Enrichment with Omega-3 Fatty Acids. Woodhead Publishing Series in Food Science, Technology and Nutrition. Elsevier Science. p. 65. ISBN 978-0-85709-886-3. Retrieved May 17, 2017. ^ Makinen, Julie (May 4, 2016). "A North Korean farm may not be what it appears". Los Angeles Times. Retrieved May 19, 2017. ^ "Coffee shops are latest luxury in North Korean capital". News.com.au. April 6, 2016. Retrieved May 17, 2017. ^ a b Wong, Sue-Lin; Pearson, James (May 11, 2017). "Here's what it's like inside a North Korean grocery store". Business Insider. Retrieved May 19, 2017. ^ 헤럴드경제 (February 18, 2011). 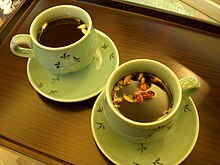 "Korean teas, not just green". The Korea Herald. Retrieved May 17, 2017. ^ "Meet the North Korea Apologist Who Opened a Cafe to Spread the 'Truth' About North Korea". Vice. October 22, 2016. Retrieved May 17, 2017. ^ a b c d Talmadge, Eric (April 20, 2017). "Coca-Cola bubbling up in North Korea - and it's (usually not) the Real Thing". Toronto Star. Retrieved May 18, 2017. ^ Lockett, Jon (January 27, 2017). "Hidden side of North Korea's mysterious capital Pyongyang revealed in incredible pictures - from golf courses to adverts for fake Coca-Cola". The Sun. Retrieved May 18, 2017. ^ Wong, Sue-Lin; Pearson, James (May 8, 2017). "Made in North Korea: As tougher sanctions loom, more local goods in stores". Reuters. Retrieved May 18, 2017. ^ Kim, M. (2010). Escaping North Korea: Defiance and Hope in the World's Most Repressive Country. Rowman & Littlefield Publishers. p. 42. ISBN 978-0-7425-5733-8. Retrieved May 19, 2017. ^ Fullerton, Jamie (March 29, 2017). "Munchies in North Korea: Sinking Pints in Pyongyang's Beer Bars". Vice. Retrieved May 19, 2017. ^ Hunwick, Robert Foyle (2013-09-04). "Getting Drunk in North Korea". The Atlantic. Retrieved 2017-05-19. ^ Volodzko, David (August 11, 2016). "The Rise of South Korea's Craft Brewing Scene". Vice. Retrieved May 17, 2017. ^ Steadman, Ian (May 12, 2017). "'Kim Jong-Ale': North Korea's surprising microbrewery culture explored". Wired UK. Retrieved May 19, 2017. ^ a b Ji, Dagyum (August 16, 2016). "Plastered in Pyongyang: North Korea launches its first beer festival". The Guardian. Retrieved May 19, 2017. ^ Evans, Stephen (September 12, 2016). "Sneaking a taste of North Korea's finest beer". BBC News. Retrieved May 19, 2017. ^ Herskovitz, Jon (March 10, 2008). "Brewing beer, Communist style, in North Korea". The New York Times. Retrieved May 19, 2017. Winn, Patrick (May 6, 2016). "What's behind the restaurants North Korea runs around the world? Kitsch — and perhaps recordings". Public Radio International. Retrieved May 20, 2017.